Remembered Here today, One of the Citys unsung Heroes. Sydney Carlin was born in Spring Bank, Hull, Yorkshire on 24th March 1889, he enlisted in the army in 1908 but his duties as a private in the 18th Queen Mary’s Own Royal Hussars based in York and the Curragh in Ireland were tedious and he accepted his father’s offer to buy him out of the Army reportedly for the sum of £18 in 1909 aged 19. He returned to Hull and took up farming and with the outbreak of World War 1 he re-enlisted in his old Regiment and sailed for France on 15th August 1914, as part of the 2nd Cavalry Brigade. His Unit suffered heavy casualties during the First Battle of Ypres in May 1915 and at the second Battle of Ypres the 18th Hussars endured days of sustained bombardment with such heavy losses that he on occasions assumed command of his troop even though he had been wounded in the head, he refused to be evacuated till they were taken out of the line. He then passed through the military hospital at Wimereux and on to Charing Cross Hospital back in England, was awarded the Distinguished Conduct Medal on 5th August 1915, and was back in the Ypres Salient in September 1915. In the Spring of 1916 his unit went south to take part in the Battle of the Somme, on 17th/18th July 1916 he was seriously injured by shrapnel in his left leg and awarded the Military Cross on 20th October 1916. His leg did not heal and had to be amputated in early 1917 and unwilling to be invalided out of the war he decided to apply to join the RFC and paid for private flying lessons to strengthen his case, this paid off and he was passed as Fit on 7th August 1917, he joined the RFC at the end of August and was posted to the 1st School of Aeronautics then on to the Central Flying School at Upavon Wiltshire on 9th October 1917. 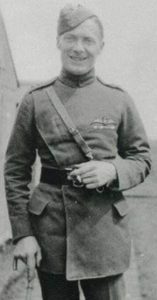 He was appointed as a Flying Officer on 12th March 1918 and on May 26th he joined 74 ‘Tiger’ Squadron in northern France based at Clairmarais, he destroyed five enemy aircraft and six balloons, on 2nd August he was awarded the DFC. On 21st September 1918 he was shot down and was lucky to bring his aircraft down in No-Mans land, captured on the spot and sent in stages to a prison camp at Karlsruhe, repatriated on 13th December 1918, in October 1919 he relinquished his commission due to his disability. In 1922 he went to Africa and served as a staff officer in the Kenya Defence Force from 1930 to 1935 and in August 1939 with war imminent he fetched up in Malta and immediately volunteered for military service, disguising his true age of 50 he was appointed as a lieutenant in the 7th Anti-Aircraft Regiment Royal Artillery, he applied to join the RAFVR being accepted, despite his disability, as an Air Gunner, he flew back to England in early July 1940 and reported to the Air Armaments School at Manby near Louth in Lincolnshire, in August he was posted to 264 Squadron operating Defiants from Hornchurch and was flying operationally on 28th August. On 29th August 264 Squadron was posted to night-fighting duties at Kirton-in-Lindsey, on 5th January 1941 he was posted to 151 Squadron based at RAF Wittering, where he resumed night interception missions against enemy bombers attacking the Midlands. on 8th May 1941 Wittering was attacked by a lone Ju88 that swept in low, it strafed A flight dispersal and dropped a stick of 8 anti-personnel bombs, instead of taking cover he was seen to take his bicycle and pedal furiously out to his parked aircraft he was climbing into the turret presumably intending to use the four machine-guns against the raider when the bombs detonated, two aircraft were destroyed and four others damaged, one of his arms was severed and he was dead when aid arrived, he was 52 and cremated at Hull Crematorium.